C -How can you manipulate its limbs? You will start to take the forelimbs. You have to be always positioned against the animal and looking at the stern. Find your position to have a good balance and to maintain the fore limb for a few minutes. When you can do that perfectly with the forelimbs, you will do with the hindlimb and will maintain the same position of your body against the donkey. 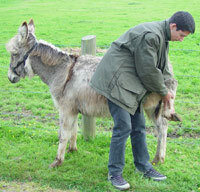 The donkeys are very soft, but like any animal it can have unpredictable reactions. You should never go behind him before saying and to make a point to always be careful about an accidental kick. When it will accept that this the farrier can come and you will have no problem. If the farrier has a bad experience with the donkey, he will change his opinion quickly.